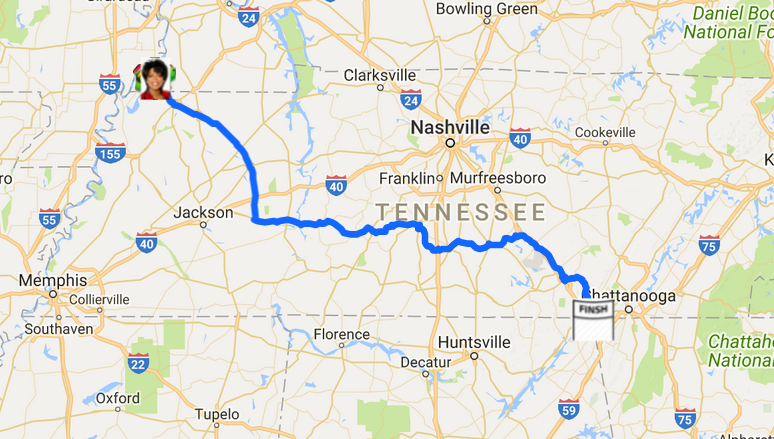 The initial 12 hours had Westbrook in Martin, TN. He text he was there, saying “Not good,” with this photo attached. Still no news on what happened. 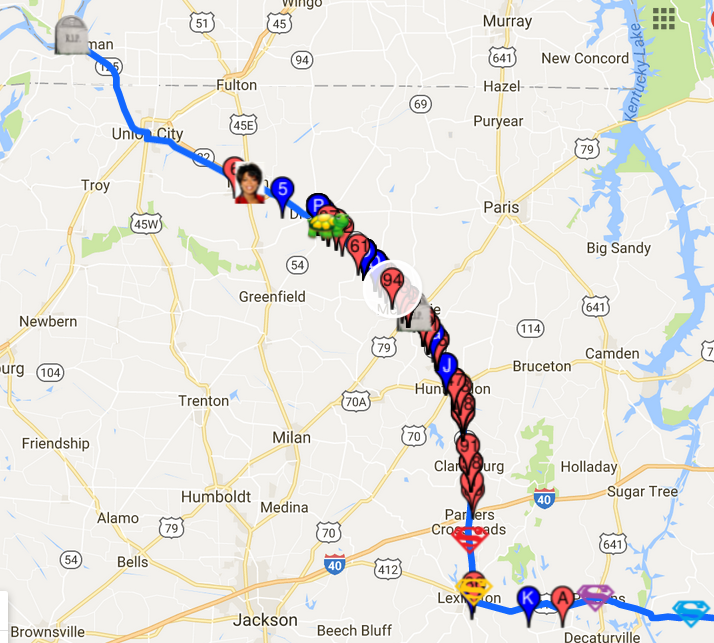 24 hours into the race, he is past Gleason, TN at 53 miles. 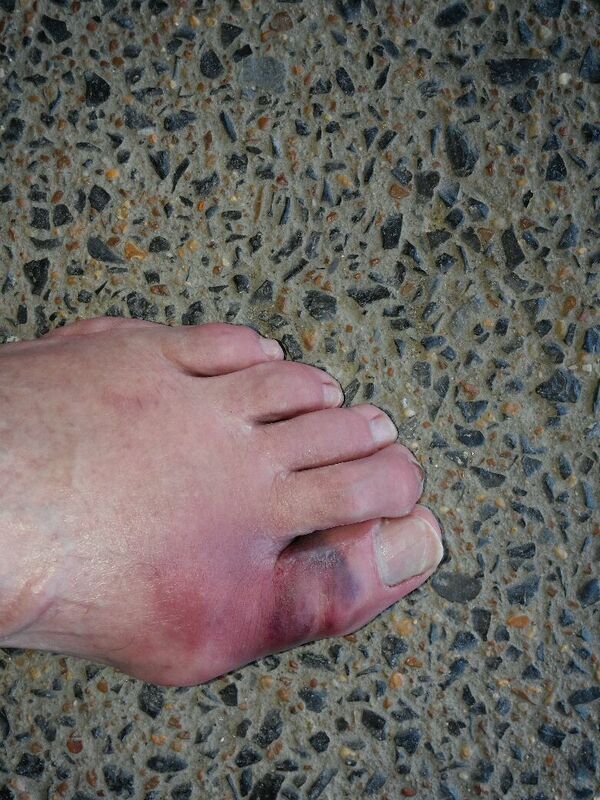 Last report is he has had to resort to walking with his foot. Not too sure how this is going to go for him. Westbrook is number 94 on the map. NUMBER 67 – 36 hours later, Westbrook has scooted along into 48th (tied with two others) in the screwed division. He is at mile 72 and past Huntingdon, Tennessee. He trudges along with a painful hamstring fully intending to make the cut off time. Thus far, out of the initial 73 unsupported runners, 5 have dropped out of the race. One more attempted to quit but has now begun moving along again, leaving 68 in the solo running category. Shown as number 67 on the map – 24 hours into the race and Westbrook has completed 50 miles and just past Gleason, Tennessee. Still running with a hurt hamstring he has crept into 52nd place, tied with two other runners. He continues to push forward. Westbrook is identified as number 67 in the white highlighted circle on the map above. As of 12 hours in, he is at mile 27, approaching Martin, Tennessee. Currently Richard is tied with two other runners for 68th place among the unsupported “screwed” runners. There are a total of 73 runners in this year’s screwed division. His call in to home let us know that he is having a lot of problems with his hamstring and did not get off to the best start. He will continue on and see how it feels later. Richard Westbrook is at it again, the Last Annual Vol State Road Race. He has entered as an unsupported runner, as always. He begins the daunting 314 miles from Missouri/Kentucky, through Tennessee, finishing in Georgia with nothing but a small pack on his back. The race course is mapped out above. He tested his pack prior to leaving on his 3 year old granddaughter, Braylee (Rainbow). I guess he deemed it light enough since upon wearing it she didn’t fall over. I did not get the weight of his pack this year but it is usually around 8 lbs or so. Stay with us to learn more updates of how he doing throughout. Keep him in your prayers and wish him luck! Westbrook was one of 18 runners to start the 12 hour leg of the Locomotion 6 and 12 hour race consisting of 2 mile loops around Camp Jordan in East Ridge, Tennessee. The race started a little late at 7:33 am. Richard worked himself into 3rd place and held that until the finish. He completed 56 miles in a little under 12 hours. His goal was 50 miles so he exceeded his expectations after coming off of low mileage days with a hurt foot. One 20 miler was the furthest he ran in training prior to this race day. At first, he hoped to complete 30 miles, then 40, and onto 50. He ran ahead of pace on the warm and sunny day, albeit crazy headwinds on the starting side of the loop.